Please join us for an artist talk by British artist Giles Round on Monday 23 February at 7pm in the gallery. Round’s work Untitled, 1943/1944 (SORRY!) is currently installed on the corner of St. Clarens and Bloor Street West. Giles Round looks to the language of modernism to explore the history of ideological positions that proposed methods for new modes of living and production, and the influence these have had on how we live in the present. His works trace alternative histories of British modernism – those that are often overshadowed by the canonical modernist narrative and particularly those relating to the decorative or domestic. As such, his work encompasses sculpture, architecture, typography, furniture and functional objects. Through these various forms he engages with the discourse and ideas that dismantle the hierarchies between applied and fine arts and merge art and life. There exists an allusion to moments of collectivity, inherent within the history of modernism itself, hinting at past, present and future euphoria. Since 2011, he has been working on three conceptually driven long-term and large-scale projects; The Coniston Secession, The Grantchester Pottery and THE SCHTIP. The Grantchester Pottery mimics the structure of historic artist decorative arts studios such as Omega Workshops and Hammer Prints Ltd, to embrace and elicit collaborative anonymous artist design, producing utilitarian ceramics, alongside other decorative household items – such as printed and woven textiles, wallpaper, painted furniture and hand painted murals. Developed in close collaboration with Grizedale Arts, Cumbria, The Coniston Secession, is a long-term project and meta-structure in which to produce works – Grizedale Arts acts as producer and skilled artisans as manufacturers. THE SCHTIP is a collaboration between two artists, Giles Round & Sarah Staton. Founded in April 2013, THE SCHTIP is mutable in form and has to date operated as gallery, architectural practice and artist. 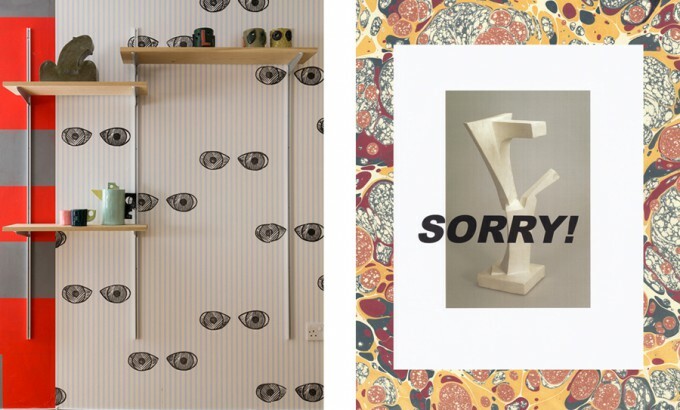 Image credit from left: Giles Round, installation view of The Grantchester Pottery at Institute of Contemporary Arts, London, including contributions from Maria Loboda, Dietmar Lutz & Sam Windett. Giles Round, Untitled, 1943/1944 (SORRY!) , 2014.